Conceiving an idea is in itself a paramount affair. Now that you have an idea, creating something of value out of it is the next big thing. Your idea needs a lot of processing before it can even minutely accomplish its proverbially set expectations. While planning a new venture in business, there are some major factors that you can’t afford to miss. This is important if you are planning to outsource the job. Outsourcing has its own pros and cons and the right decision can do a lot more than what was planned. From the development point of view, you may not be able to give it your best but since you have a plan that can do wonders, outsourcing the job makes it much viable for you. This also stands true if you don’t have an in-house development team that can help complete the task. About 65 percent business houses have vouched for the outsourcing program while the remaining 35 percent had in-house development teams to the rescue. 2. Time to Focus: Having outsourced the work to another team, lets you and your core team focus on the major areas of business. You can now plan your work and employee your best talents at it instead of focusing a lot on the development of your brain child. This will save you of a time and energy that would have to otherwise be aligned to accommodate your usual business as well as the level of work that your plan demands. An in-house team may have to focus on the project at hand and this may not go well with the usual work that has to be taken care of. 3. Quality: Having estimated and found resources to fund your ideas, you may now plan to hire a team to work on it but what most businesses fail to realise is that hiring a team isn’t cakewalk and it was found that almost 60 percent such technology-based ideas have been shelved halfway due to the inability and incompetence of the newly hired team to comprehend and work towards the end goals. Failure at maintaining quality may be mitigated to a great extent by outsourcing work instead of entering into a vicious circle of hiring new team members and losing out on time and resources. It is always advisable to outsource PHP developers in India who have a rich portfolio to their name. Make sure that you indulge into a fruitful discussion with them to make sure that they maintain the standard of work expected. 4. Communication: Lack of proper communication and documentation has been observed to be contributing towards major misses while outsourcing. While outsourcing the job, most businesses have failed to communicate, discuss and document major factors in between sessions. This has been noted to be the major factor that has forced tech startups to shelve ideas half way through the project. Make sure that you provide complete justice to your investment and the efforts of the PHP team. 5. Big or Small Company: A startup company or an experienced player? A multinational gamer or a small team of experienced and skilled developers; what’s your take? Choosing the right company for your idea is necessary. Cost and quality; the tug of war continues. Choosing an optimum size depends upon your expectations, investment and acceptable levels of risk. Though it’s always advisable to opt for a quality based plan, the appropriate option is a mélange of all the major factors taken together. 6. Plan for contingencies: Change is the mantra and with a global exposure comes the threat of the many factors that can affect the global business environment. It’s imperative that you plan and provide for the many changes that your business may be susceptible to. From economic regressions to political dilemmas, there’s a lot that you have to consider before outsourcing the work to another. 7. Place of Outsourcing: The region to where you plan to outsource is another factor that demands introspection. 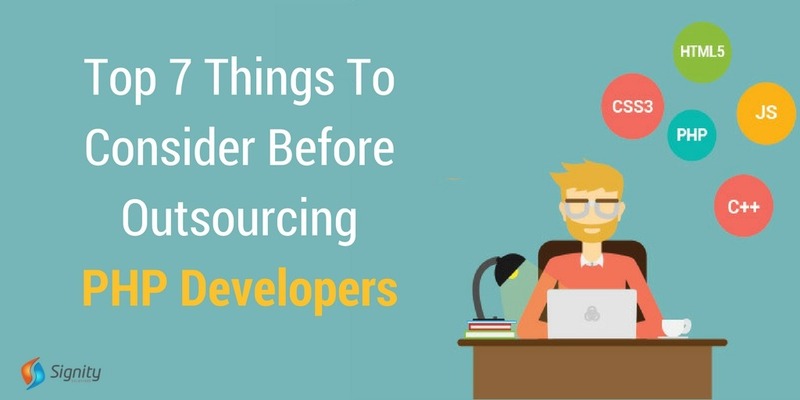 You ought to find out if the developers belong to regions where the outsourcing is relatively less expensive. It will help keep your costs under control and also help you gain the reins over the project easily. Outsourcing to countries like Spain, India, etc. may prove to be economically beneficial as compared to their costly counterparts. Conceptualization is tough but the next big part is the transition of the idea into a technical reality. Perfecting the idea lay in your hands but perfecting the project remains confined to the walls of your PHP developer. Hence, your outsourcing of work has to be planned meticulously to help your business attain its goals. Rest assured, with the right outsourced PHP developer team, you’ve managed to complete about 50 percent of your job perfectly. Have an amazing idea that can help your business reach its ultimate? Come, share it with an amazing team of expert developers at Signity Solutions. For any questions or assistance, drop in a line at sales@signitysolutions.com. At Signity, every idea turns into a tech reality.